Multimodal interventions can improve long-term perception of recovery, as well as balance, gait, grip strength, and working memory in a mixed population of individuals in late phase after stroke. 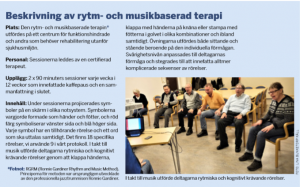 The Ronnie Gardiner Method has been implemented with health care and rehabilitation since 1993 in Sweden. This method can be used to help people with brain injuries, diseases of the central nervous system as well as use with healthy brains. The Ronnie Gardiner Method is multisensory using: audio, visual, tactile and kinetic energy with rhythm, music and sound/movement codes. This method is practiced with the advantage of a group activity as well as individually. The Ronnie Gardiner Method stimulates: mobility, reading, speech, self-esteem, body image, balance, memory, motor skills, concentration and social skill. Do you want to contribute to the work of RGM? This entry was posted in Okategoriserade and tagged brain, cognition, follow -up studies, music, musictherapy, neurologicalrehabilitation, parkinsons, petrapohl, rehabilitation, research, RGM, stroke on 07/06/2015 by Webmaster.